Treatment of a carbonyl compound with H2O in the presence of acid or base catalyst adds the elements of H and OH across the carbonyl bond, forming a gem-diol or hydrate. The carbonyl group of aldehydes and ketones can be hydrated by water but this reaction is relatively slow under neutral conditions. Thus, in the presence of either acid or base, the rate of reaction is readily enhanced. The base-catalyzed mechanism consists of two steps. In the first step, hydroxide (base catalyst) function as the nucleophile, attacks carbonyl carbon, and form an anionic intermediate. 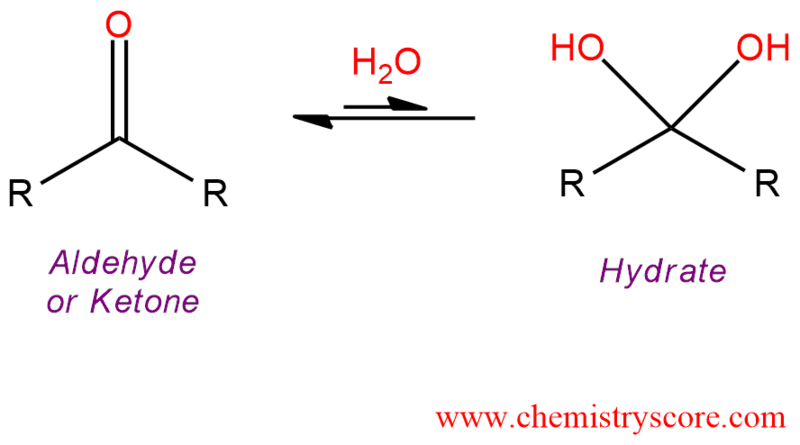 This intermediate, in the next step, is protonated by water, regenerating a hydroxide ion. The acid-catalyzed mechanism consists of three steps. In the first step, the carbonyl group is protonated by hydronium ion (acid catalyst). Then this protonated carbonyl which is now more electrophilic is attacked by water and form an oxonium ion (second step). And in the final step, oxonium ion is deprotonated by water and give the product (diol). Carbonyl hydrates are usually not possible to isolate as pure substances. They lose water too easily, regenerating the original carbonyl compound. Thus, they may participate as intermediate in some reactions.